This book will demystify the self-publishing process and present you with 13 simple steps to successfully and cost effectively self-publish your book. The steps described herein specifically relate to Print-on-Demand (PoD) publishing. If you have a book in you dying to get out, self-publishing can be an extremely cost effective, painless and quick way to publication. 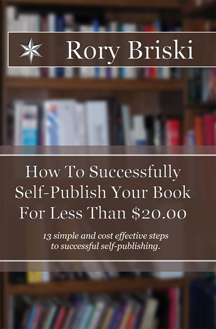 How To Successfully Self-Publish Your Book For Less Than $20.00. 13 simple, effective and proven steps to get your book published for less than $20.00. If you follow this easy process, by the end of this book you will have a professionally printed and bound copy of your book in your hands and ready for sale. This book will demystify the self-publishing process and present you with simple steps to successfully and cost effectively self-publish your book. The steps described herein specifically relate to Print-on-Demand (PoD) publishing. If you have a book in you dying to get out, self-publishing can be an extremely cost effective, painless and quick way to publication. In this book you will also learn about some "options" that will take you over the $20.00 mentioned in the title. These "options" provide value for many people but they are NOT required to successfully self-publish your book. This book also makes the assumption that you are familiar with using your word processing software. There is information on the "tricky bits" of formatting (interior and cover) and also graphics/image insertion and you will have to have some "basic" word processing knowledge in order to self-publish. And if you don't have the basic skills, you should not be afraid to visit the <help> tab in your word processor to learn more about what is discussed. This book is written in a casual tone and style. These books are available globally at your favorite book seller.